A Lockheed engineer is probably the last person you'd expect to break the news of a Hollywood mega-blockbuster sequel, but here we go! Flightglobal is reporting Top Gun 2 is not only happening, but starring Tom Cruise (!) as an F-35 pilot. Ha! The bizarre news, centered around a movie that doesn't even have an IMDB page and a broken airplane, is taking a little bit to process here. The first question: what will Tom Cruise do? Stand on a runway, staring at his grounded F-35? Will the F-35 be a metaphor for some kind of personal growth? 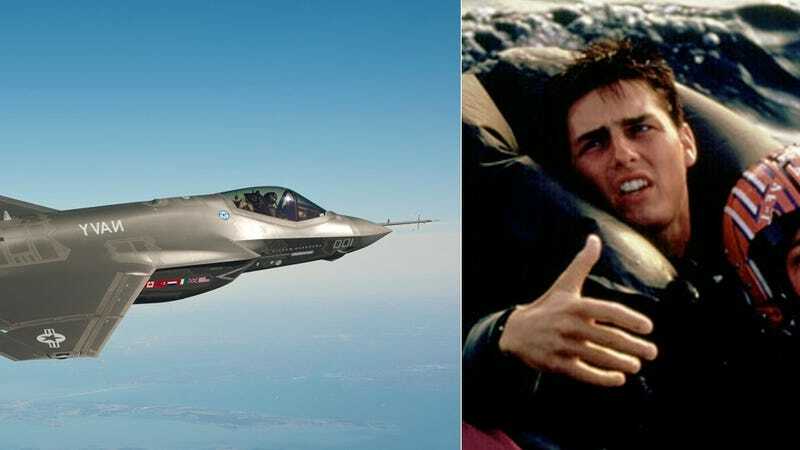 Is the Tom Cruise Lockheed is talking about the same Tom Cruise? Will he fix all of the plane's electrical problems to get the girl? I think the story about the TOP GUN2 movie being produced is correct. I met a girl out a Dallas night club who told me her father was a Dallas movie writer. She said her dad was a writer working on a project and then asked if I remembered the movie TOP GUN. I know this may sound crazy but she told me her dad was Don Ferrarone. Curiously I looked into IMDB and it looks like her sister is credited in a few films too. CRAZY, I didn't know if it was a night of just drunken talk but it seems very possible. PS: Oh btw she wrote her info on my phonebook as "Dallas movie writer" When I asked why, she told me so I won't forget her.